It’s time for elections, and the Deve Gowda clan has begun consulting a series of astrologers and visiting temples to ensure a win, not just for their party — the Janata Dal (Secular) — but two of the latest political entrants from the family — the former PM’s grandsons Prajwal Revanna and Nikhil Kumaraswamy. 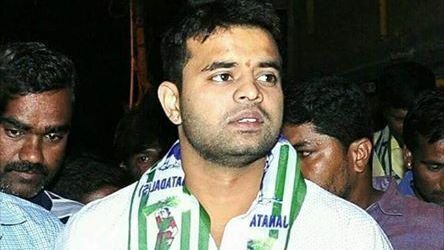 Prajwal will be contesting from the Hassan seat and Nikhil from the Mandya Parliamentary constituency. Anitha Kumaraswamy, the wife of Karnataka Chief Minister H.D. Kumaraswamy, travels 160 kilometres every Tuesday to the Hole Anjaneya Swamy Temple, just outside Maddur in Mandya district, to offer Rs 1.25 to the deity, in a bid to improve the poll chances of her son Nikhil. With his wife on a temple run, the chief minister has been visiting astrologers to determine Nikhil’s prospects. Kumaraswamy recently visited the famous Bengaluru-based astrologer R. Dwarakanath to seek advice on the best possible time to launch Nikhil’s election campaign. Kumaraswamy’s brother, H.D. Revanna, considered the more superstitious of the two, once famously travelled 300 km a day from Hassan to Bengaluru for nearly a month until his official quarters was made vaastu-compliant. His temple visits have almost doubled since it was announced that his son, Prajwal, would contest from Hassan. The day Deve Gowda officially announced that he would be giving up his seat, Prajwal was asked to wake up at exactly 4.55 am and perform a series of pujas at the Lakshminarasimha temple at Holenarsipura in Hassan. As part of the ritual, the family returned home to be welcomed by a group of transgenders who gave Prajwal a Re 1 coin and asked him to keep it safe till the end of elections. On Wednesday, when Prime Minister Narendra Modi took to Twitter to urge eminent personalities to encourage voters to come out and vote, he tagged not just film, sports, media celebrities and his party’s allies, but also political rivals. Top opposition leaders — from Rahul Gandhi to Sharad Pawar, Mayawati, Akhilesh Yadav, Naveen Patnaik, H.D. Kumaraswamy, Chandrababu Naidu, Jagan Reddy, Mamata Banerjee, Tejaswi Yadav and M K Stalin — were tagged. With the growing bitterness between the government and opposition, Modi has shared an acrid equation with most of these leaders, including with ally-turned-foe Naidu. However, despite that, the PM chose to reach out to most top opposition leaders — except one. Conspicuously absent was Delhi Chief Minister Arvind Kejriwal, who is very active on the microblogging platform. With this, the PM seems to have sent out a subtle message of whom he considers as a political rival not worth engaging with. Also left out were politicians from the state of Jammu and Kashmir and Left parties. This isn’t the first time the PM has used Twitter to reach out to his rivals. On World Tourism Day, 27 September last year, chief ministers of different states tweeted about what their respective states had to offer to tourists, which Modi decided to retweet from his personal handle. These included the tweets of Punjab CM Captain Amarinder Singh, West Bengal CM Mamata Banerjee, Odisha CM Naveen Patnaik and Kerala CM Pinarayi Vijayan, with none of whom he has friendly ties. Then again, in June last year, the PM tagged Karnataka Chief Minister H.D. Kumaraswamy in the then ‘fitness challenge’, barely days after the Congress-JD(S) managed to form the government in the state after a near war with the BJP that had emerged as the single largest party.